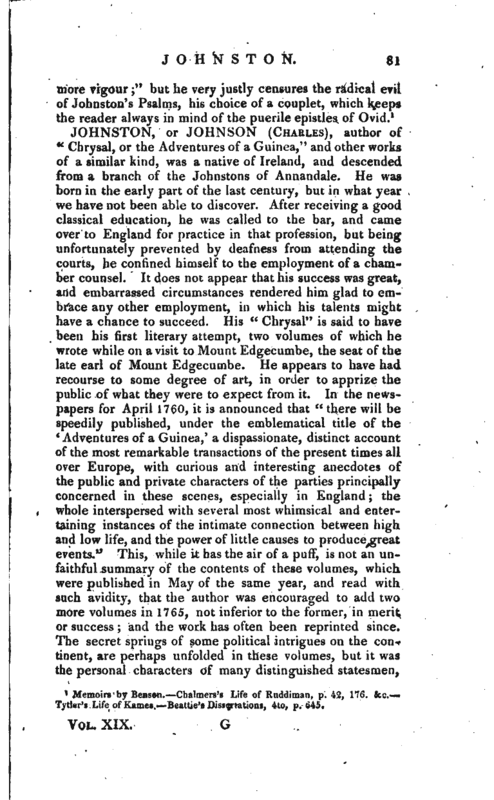 , author of <c Chrysal, or the Adventures 'of a Guinea,“and other works of a similar kind, was a native of Ireland, and descended from a branch of the Johnstons of Annandale. He was born in the early part of the last century, but in what year we have not been able to discover. After receiving a good classical education, he was called to the bar, and came over to England for practice in that profession, but being unfortunately prevented by deafness from attending the courts, he confined himself to the employment of a chamber counsel. It does not appear that his success was great, and embarrassed circumstances rendered him glad to embrace any other employment, in which his talents might have a chance to succeed. His” Chrysal“is said to have been his first literary attempt, two volumes of which he wrote while on a visit to Mount Edgecumbe, the seat of the late earl of Mount Edgecumbe. He appears to have had recourse to some degree of art, in order to apprize the public of what they were to expect from it. In the newspapers for April 1760, it is announced that” there will be speedily published, under the emblematical title of the f Adventures of a Guinea/ a dispassionate, distinct account of the most remarkable transactions of the present times all over Europe, with curious and interesting anecdotes of the public and private characters of the parties principally concerned in these scenes, especially in England; the whole interspersed with several most whimsical and entertaining instances of the intimate connection between high and low life, and the power of little causes to produce great events.“This, while it has the air of a puff, is not an unfaithful summary of the contents of these volumes, which were published in May of the same year, and read with such avidity, that the author was encouraged to add two more volumes in 1765, not inferior to the former, in merit or success; and the work has often been reprinted since. The secret springs of some political intrigues on the continent, are perhaps unfolded in these volumes, but it was the personal characters of many distinguished statesmen, | women of quality, and citizens, which rendered the work palatable. A few of these were depicted in such striking colours as not to be mistaken; and the rest, being supposed to be equally faithful, although less obvious, the public were long amused in conjecturing the originals. 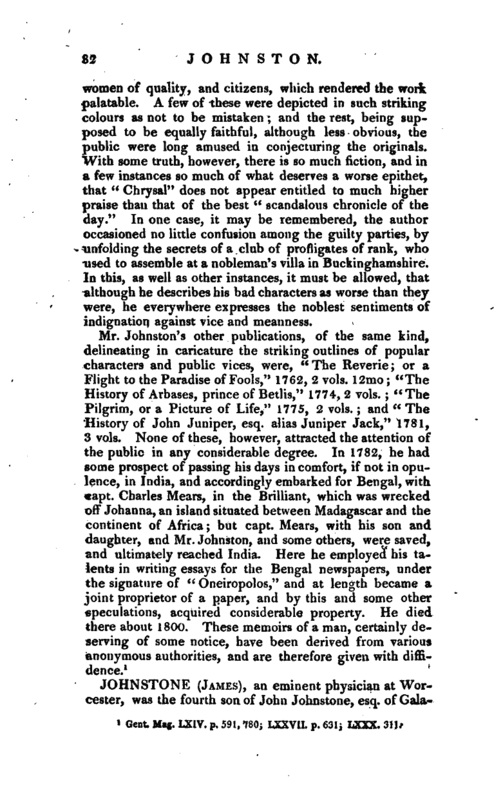 With some truth, however, there is so much fiction, and in a few instances so much of what deserves a worse epithet, that” Chrysal“does not appear entitled to much higher praise than that of the best” scandalous chronicle of the day." In one case, it may be remembered, the author occasioned no little confusion among the guilty parties, by unfolding the secrets of a club of profligates of rank, who used to assemble at a nobleman’s villa in Buckinghamshire. In this, as well as other instances, it must be allowed, that although he describes his bad characters as worse than they were, he everywhere expresses the noblest sentiments of indignation against vice and meanness.